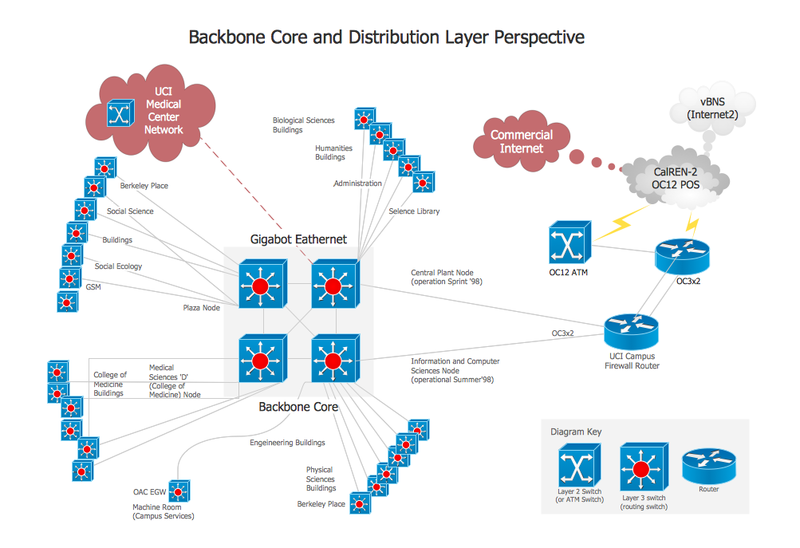 Backbone network is a part of computer network infrastructure that interconnects various pieces of network, providing a path for the exchange of information between different LANs or subnetworks. ConceptDraw has 1004 vector stencils in the 40 libraries that helps you to start using software for designing your own Backbone Network Diagrams. This backbone network diagram sample is created using ConceptDraw DIAGRAM diagramming and vector drawing software enhanced with Computer & Networks solution from ConceptDraw Solution Park. Computer & Networks solution provides samples, templates and libraries of symbols for all types of computer network diagrams, LAN and WAN floor plan layouts, network communication plans, Cisco network diagrams, Active Directory diagrams, logical and physical network diagrams, network architecture and topology diagrams. Network Diagrams visualize schematically the computer networks topology, equipment nodes and different types of their logical and physical connections. They are widely used by IT professionals to visually document the topology and design of computer and telecommunication networks. ConceptDraw DIAGRAM v12 diagramming and vector drawing software extended with Fishbone Diagrams solution is a perfect tool for software designers and software developers. If you need to create Cause and Effect diagram, Fishbone diagram, Ishikawa diagram from templates and examples, or using the predesigned elements, ConceptDraw DIAGRAM v12 can do this easily. ConceptDraw DIAGRAM v12 software gives ability to design Fishbone diagrams that identify many possible causes for an effect for problem. Each Fishbone diagram design element included to Fishbone Diagrams library is vector and ready-to-use. Networking and Content Delivery icons - Amazon AWS pro diagrams - AWS diagrams are part of architecturing tools provided with ConceptDraw Solution Park.